I love waxcap fungi. Their many bright colours – from brilliant red to pure white – and the variety in shapes – toadstools, coral shaped, club shaped and even tongue shaped mean they brighten up a walk at the time of year when everything else is dying back and the colour is slowly fading out of the countryside. Waxcap fungi like this are easy to spot. 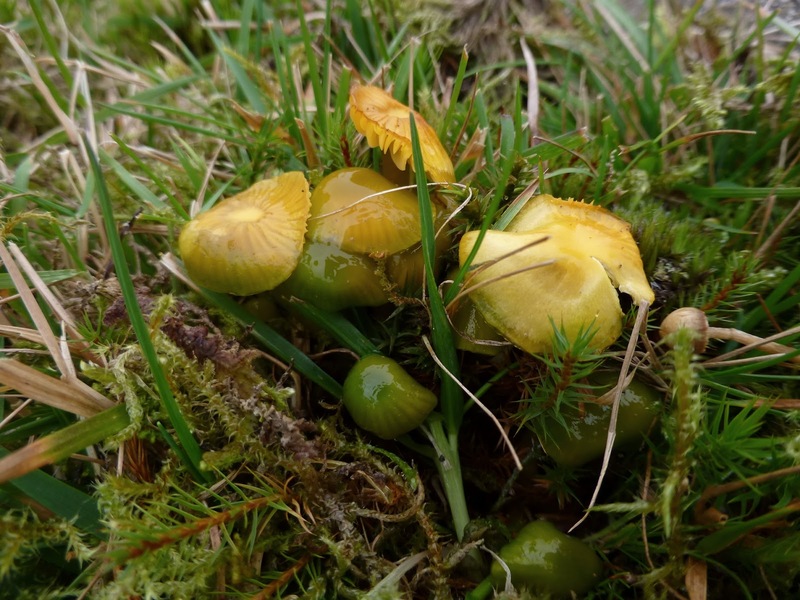 Seeing waxcaps (and associated club, coral, earth-tongue and spindles fungi) shows us that we are managing the land correctly without pollution or under-grazing. Naturally we want to preserve this ancient habitat in the same way we’d look after ancient woodland and so the best way to do this is to look for them every autumn, or more specifically – survey them. The National Trust’s Mislet Farm near Windermere is one such place where management of the land has remained unaltered for a long time and is therefore abundant with waxcap fungi. The fields on this farm are made even more important because they form part of the catchment area of the river Kent which is very special for its native crayfish. 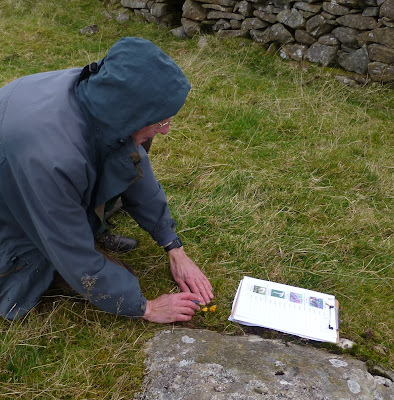 The author on a field at Mislet Farm, getting up close to a meadow waxcap. The perfect opportunity to get help surveying waxcaps came when the Flora of the Fells group organised a Fell Care day on the 25th October. The aim was to get local volunteers involved in projects all around Windermere to help with protecting the water quality of the lake. Six willing and able volunteers signed up to my request to help survey the waxcaps and after a short training session they too were hooked by their colourful beauty. Soon after that we headed out, clipboards in hand, to Mislet Farm and specifically to a field where I have seen them before. A volunteer helps with the survey, recording the numbers of fungi found. What we didn’t expect was a ‘red-letter’ day for the numbers we found – 2,045 to be exact! The bits we counted above ground were in fact the fruit of the fungi, the actual fungi is really a mass of minute threads called mycelium which spread underground and absorb water and food. Just like a fruit tree, there can be years with poor yields or there can be bumper crops depending on the weather, and today certainly showed that it had been an excellent year for these multicoloured gems. “We didn’t realise we had such a ‘hotspot’ and as a result of this volunteer survey a detailed assessment must be done to find the scale of importance for the site. It is regionally important, and could even be nationally or internationally important - from the high numbers found it is certainly ‘up there’. The value of these colourful ‘jelly babies of the grassland’ are often overlooked and yet are just as important as your orchid species if not more so. The NT already looks after one of the best sites in Europe for waxcaps at the Longshaw Estate in the Peak District. I will be enlisting the help of experts and volunteers next Autumn to get the NT farms around Windermere ‘on the map’ for their national importance too.